The reason I build kitchen cabinets rather than buy them is that it allows me to utilise all available space and not be tied to using multiples of standard sizes. It may not be any less expensive than buying flat-pack units, but it most certainly is much more satisfying! Put at its simplest, it's making boxes. French cleats can be affixed to the studs in a single run. This then requires the inner sides of the run of cabinets to be notched, but I prefer to do this than to have separate cleats. This method allows the cabinets to be slid sideways into position and once positioned the cabinets can be screwed to each other. The jig is shown in dark gray, the cleats in lighter gray. Secure the top cleat to the cabinet, as in "A", slide the jig into position, secure the bottom cleat. When fixing to the wall, calculate the position of the top cleat, invert the jig, as in "B," then repeat the steps for positioning the lower one. Since the strength of a French cleat relies on a strong cabinet backboard, I like to hang everything off the back by using housing joints (dados) and rebates (rabbets) in the carcass construction, as shown opposite. The dados are shown in dark gray, the rabbets in black. The dados are inset from the back by the depth of the French cleat. The use of central dividers to larger units adds to the stability and allows greater flexibilty of shelf positioning. Central dividers are also held in dados. Shelving is taken care of by the use of 25mm (1") on center holes for shelf pins. These should be milled prior to assembly. Melamine-coated particle board Stable and generally water-resistant. Easy to clean. Great finish on good-quality boards. Can be difficult to cut cleanly (without chipping). Needs special screws and fasteners for best performance. Cut edges need edge banding where exposed to view. Untreated edges will soak up moisture and cause failure. Plywood Stable and relatively inexpensive. Lightest in weight. Takes paint well. Prone to splintering and chipping on cut edges. Cut edges need edge banding where exposed to view. Untreated edges could soak up moisture and cause delamination. Medium Density Fibreboard (MDF) Stable, takes paint very well. Easy to cut and machine. Relatively inexpensive. Heavy. Produces fine irritant dust when cut or machined. Untreated MDF could soak up moisture and cause failure. The cabinet doors raise another set of choices - face-framed, full or partial overlaid, or fully inset. Using face frames has the advantage of covering any exposed-to-view carcass edges. Hinges can be easier to select and fit to face frames, giving a wide choice of styles. 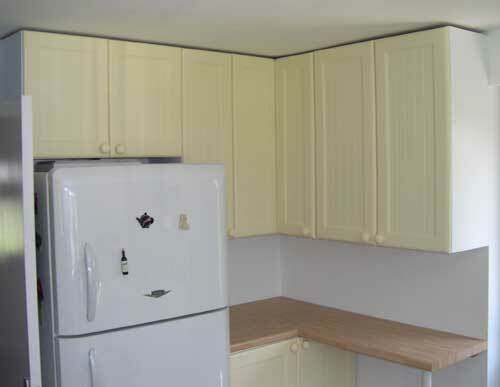 However, face-framed cabinets, especially wall units, have the disadvantage of the "lower lip" (bottom rail), that makes cleaning and retrieval of contents that much harder than in "open-carcass" designs. For this reason, I prefer not to use face-framed carcasses, even though this requires more work on forward-facing carcass edges. This is true of both inset and overlay door styles, as no-one wants to see a "raw" edge when opening a cupboard, do they? Based on the above, my choice is generally to use full-overlay doors, attached by European hinges (35mm socket fitting to door). Melamine-coated particle board (sheet) Easy to construct. Stable. Edges require banding. Hinge choice limited due to special fastenings. A bit "clinical" in appearance. Painting not recommended. Plywood (sheet) Easy to construct. Stable. Takes paint well. Relatively light in weight. Edges require banding. Sheet stock often warped, so a truly flat door will require cafeful selection of stock. Ready-made doors No construction required. Limits carcass construction to standard sizes, unless custom-made doors are ordered - often prohibitively expensive. Rail and stile panel doors Great-looking, widest choice of styles. Stable. Most difficult to construct. Could require initial outlay on tooling (rail/stile router bit set). Based on the above table, I would recommend constructing rail and stile panelled doors, even though it takes the most effort and skill. The choices in style are almost unlimited, as are the hinge options. Rails and stiles can be milled in a "production run" fashion once initial calculations are completed. Panels can be raised, inset, milled, decorated, glazed, pierced or flat. This is probably the most difficult and time-consuming part of the project, but once the design is settled, also the most satisfying. If you are in possession of a reasonably powerful router and a table to run it in, raised panels are relatively easy with the appropriate router bit set - but NEVER try to raise panels with a hand-held router! My preferred method of construction is with a table-mounted router driving a rail and stile bit set. Once purchased, the bits will last for a lifetime if properly maintained. There is an initial choice of style to be decided upon, then a few practice cuts on suitable scraps should be undertaken before producing finished parts. Rail and stile panelled doors can also be made using the tablesaw alone. This requires an ability to cut haunched tenons and make suitable mortices, but is otherwise fairly straightforward. Panels can be raised on the saw, either plain-sided or with curved sides. Both of these processes need a jig, but again are relatively straightforward for the competent woodworker. Whatever method of construction, I always mill the 35mm European hinge sockets into the stiles before assembly, as it is easier to run the stiles through the drill press than it is to drill a completed door. A few calculations can then result is a simple jig - nothing more than a piece of hardboard with correctly-positioned pilot holes - for use in marking out the corresponding hinge placements on the carcasses. Base cabinet carcass construction is - once again - box making. I always use 100mm (4") or 150mm (6") adjustable legs with plinth clips, so that a 4" or 6" toe-kick board can be clipped onto the legs once the cabinets are levelled and installed. Construction of the base units follows similar principles to the wall units, although a solid sheet back can be replaced with lighter material - provided that there are robust nailers (fitted as rails) across both the top and the back. Central dividers are a "must" in larger units, both for stability and flexibilty of shelving. As with wall units, central dividers are held in dados. Shelving is also dealt with by the use of 25mm (1")-on-center holes for shelf pins, milled prior to assembly. I hope that this has removed some of the mystery and apprehension that may have been involved. If any questions come to mind, drop me an e-mail and I'll try to help.